North Dakota Department of Health Sample ID Card. As of March 14 , 160 ID cards have been issued to qualifying patients. The following discussion by North Dakota planners has been reprinted courtesy of the North Dakota Planning Association. On April 18, 2017, a new North Dakota law became effective requiring the Department of Health to establish and implement a Medical Marijuana Program allowing for the production and processing, sale and dispensing of usable marijuana, and medical use of marijuana. The Department of Health has established eight regions in the state where dispensaries may be located and has been working on implementing the program since the law went into effect. On March 1, 2019, the first medical marijuana dispensary in North Dakota opened in Fargo. 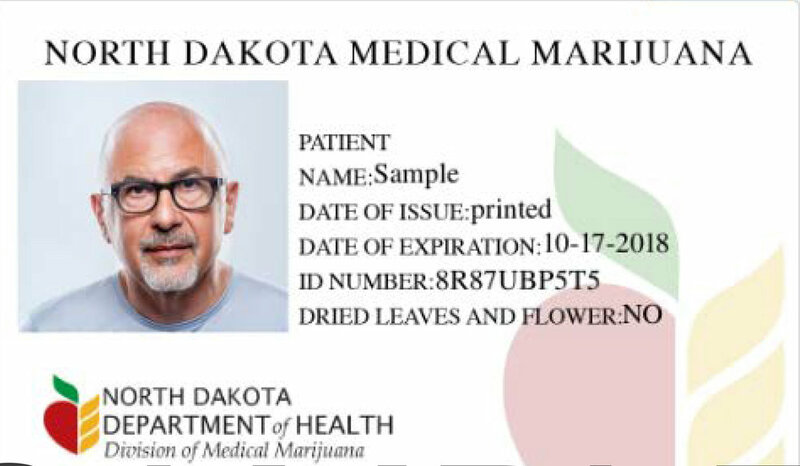 Work is continuing at dispensary locations in Bismarck, Grand Forks, and Williston to achieve their registration certificate through the Department of Health. An open application period closed on February 26 for the remaining four dispensary regions (Devils Lake, Dickinson, Jamestown and Minot). After the Compassionate Care Act was passed, City of Williston officials formed a committee to create a path forward for the City. This committee involved City Commissioners, Planning Commissioners, and staff. The committee looked at a variety of ways to accommodate Compassion Centers, and ultimately decided to allow them with a Special Use Permit (SPU) in specific zones, with additional criteria. Compassion Center – Grower was established as an SPU in M-2: Heavy Industrial Districts, which met State requirements of being 1,000 feet away from schools, as well as City-imposed requirements of being 1,000 feet away from churches and 300 feet away from residential zones. The committee felt that the potential for external impacts, including odor, was sufficient reason to require a Heavy Industrial zoning district. Concerns about odor were brought up multiple times during the public hearings based on experiences citizens and commissioners had in other states which have previously permitted marijuana usage. Based on this, the City added regulations which require a Compassion Center – Grower applicant to provide an odor control and HVAC plan with their application. While the City did not receive any applications for a Compassion Center – Grower, this was the major item discussed at the public hearings approving the Compassion Center Ordinance. Compassion Center – Distributor was established as an SPU in C-2: General Commercial, C-3: Restricted Commercial, and HCC: Highway Corridor Commercial districts. Again, any applications were required to meet State requirements and the additional City-imposed distances from churches and residential zones. Based on the pre-existing locations of schools, churches, and residences, City staff put together several maps showing the impacts of those restrictions. Because this removed the majority of developed commercial districts from consideration, the committee established an “exception area” which met State requirements but did not meet the additional City-imposed distance requirements. In hindsight, a different name for this area should probably have been used. The “exception areas” were actually major commercial areas of the City, within which a majority of the City’s commercial interactions take place. These areas include a grocery store, pharmacy, multiple restaurants, liquor stores, and a hardware store. The eventual successful application through the State ended up being located in an “exception area”, and the neighboring residents took issue with the location and that the location was an “exception”. After review by the Planning Commission and City Commission, it was determined that the SPU for the Compassion Center – Distributor met the review criteria for a special permitted use and was determined not to be incompatible with the neighboring area, as it was on the north side of a strip mall from the residences that were over 500 feet to the south. The protest by neighbors appeared to be based more on concern regarding the nature of the business and location immediately behind their residential neighborhood than in worry about traffic, pollution, and other concrete externalities required for review by the SPU. The SPU requirement put both City and Planning Commissioners in a tight spot, having to make a decision for the good of the larger community. Denying the SPU after the State had already approved the application would have jeopardized the ability of the City to have a Compassion Center. Knowing that over 60 percent of County residents voted for Medical Marijuana during the State referendum meant that City Commissioners were aware that this was a desired service from the Community as a whole. Further, the public attention focused on the decision during the SPU process meant the public weighed in through social media and the newspaper, and was aware of dates that the SPU was before the City and Planning Commissions. This made commissioners aware of the support for the project in the wider community. Following the state legislature’s passage of the medical marijuana bill in April of 2017, the City of Fargo evaluated medical marijuana-related land uses in relation to the City’s Land Development Code and determined the land use classification of the grow facility to be “manufacturing and production,” and the land use classification of the dispensary to be “retail sales and service.” The “manufacturing and production” use is allowed by right in the Limited Industrial and General Industrial zones. The “retail sales and service use” is allowed by right in the Limited Industrial zone and all commercial zones. The City had no further requirements, such as a conditional use permit, for either one of these land uses, nor were minimum separation distances from any facilities or zones other than a school required. The Fargo Planning Department received applications for eight sites for grow facilities and 25 sites for dispensaries. These applications were reviewed for compliance with the City’s zoning regulations. For the dispensary applications, the Planning Department also confirmed compliance with the required distance from a school. Eight dispensary applications were disqualified due to proximity to a school, and others were withdrawn by the applicants, so only 11 went forward to the state. The state’s evaluation of all the applications resulted in one grow facility and one dispensary being approved in Fargo. The dispensary opened on March 1, 2019. The grow facility is in the process of getting its certificate of occupancy through Fargo’s Inspections Department. The location which was approved for the grow facility was undeveloped, so new buildings have to be constructed. The grow facility operator is working with the Inspections Department to finalize this facility. One of the requirements of the state law was that the grow facility and dispensary could not be located within 1,000 feet of a school. The term “school” in this context includes not just public elementary schools, but such institutions as cosmetology and other professional and technical training schools, private schools, and universities. To verify compliance with this part of the regulations, Planning Department staff drove the area within 1,000 feet of the application locations and found a surprising number of schools throughout the city. In addition, the presence of North Dakota State University classroom buildings in downtown Fargo excluded most of downtown from consideration, making most of this area ineligible for dispensaries which would otherwise be allowed by right in the DMU, Downtown Mixed Use zone. Additionally, Fargo is home to the medical marijuana testing lab. This lab was selected by the state separately from the grow facility and dispensary. The Planning Department originally classified this use as “Industrial Service—Research and Development Lab,” a use that would be allowed only in industrial zones. Upon further review and information from the lab operator, this use was reclassified as “office—medical lab,” which is allowed in the LI, Limited Industrial zones as well as commercial zones. Shortly after the passage of the Compassionate Care Act, Bismarck staff were part of a discussion coordinated by the North Dakota League of Cities on local implementation of the law. Based on those discussions, Bismarck staff reached a consensus that both manufacturing facilities and dispensaries could be addressed under our current zoning ordinance without establishing additional regulations. An update on our approach was provided to the City Commission in August 2017. The City of Bismarck’s zoning ordinance utilizes use groups that include a variety of land uses based on similar characteristics. We made a determination that a compassion center/medical marijuana dispensary would be in the retail sales and service use in the downtown zoning districts and in the retail group A use group in other zoning districts. Retail sales and service is a permitted use in the DC – Downtown Core and DF – Downtown Fringe zoning districts and the retail group A use group is a permitted use in the CA – Commercial, CG –Commercial, and MA – Industrial zoning districts. In addition, we made a determination that a compassion center/medical marijuana manufacturing facility would be in the industrial group A use group and is a permitted use in the MA – Industrial and MB – Industrial zoning districts. We relayed this information when we received inquiries and informed potential applicants that any location must also comply with the provision of the North Dakota Department of Health that prohibits locating a compassion center/medical marijuana dispensary within 1,000 feet of a property line of an existing public or private school. We also recommended that applicants verified that information independently to ensure compliance. With our approach, there were few issues with local implementation of the law. We did receive some inquiries on the location of the manufacturing facility, primarily because the local newspaper published the address and a photograph of the facility. The manufacturing facility is operational and a location for a dispensary has been approved by the North Dakota Department of Health; and the application for the site plan and building permit was recently approved for that facility.